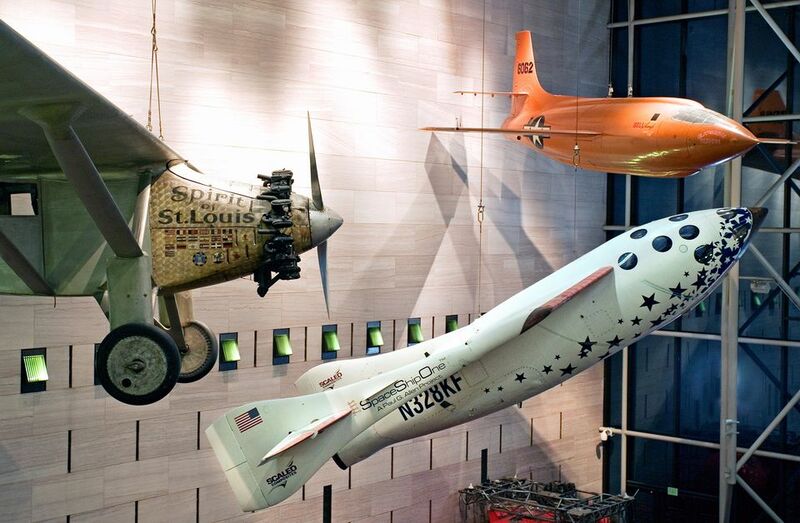 The Smithsonian National Air and Space Museum maintains the largest collection of historic air and spacecraft in the world. The museum features 22 exhibition galleries, displaying hundreds of artifacts including the original Wright 1903 Flyer, the "Spirit of St. Louis," and the Apollo 11 command module. It is the most visited museum in the world and appeals to all ages. Many of the exhibits are interactive and great for kids. The Museum completed an extensive renovation of its main hall, “Milestones of Flight” in 2016. The expanded exhibition traces the interconnected stories of the world’s most significant aircraft and spacecraft, with digital displays and a mobile experience in a new design that stretches from one entrance to the other. The square footage of the exhibition was enlarged, and the displays take full advantage of the atrium’s two-story height. New icons on display include the huge Apollo Lunar Module, the Telstar satellite and the model of the “Starship Enterprise” used in the Star Trek television series. Phone: (202) 357-2700. The easiest way to get to the Mall is by public transportation. The closest Metro stations are Smithsonian and L'Enfant Plaza. Museum Hours: Open daily except December 25. Regular hours are 10:00 a.m. to 5:30 p.m.
You can ride in several 4-minute flight simulator rides. Take a journey through space or to natural and manmade wonders of the world at the Lockheed Martin IMAX Theater. Watch a film projected on a five-story-high screen with six-channel digital surround sound. Take a 20-minute tour of the universe at the Albert Einstein Planetarium with its high tech dual digital projection system, Shows often sell out, so purchase your tickets before viewing the rest of the museum. Tickets can be purchased in advance at (877) WDC-IMAX. The National Air and Space Museum continues to develop new exhibits on the history, science, and technology of aviation and space flight. The museum is a center for research and provides guided tours, educational programs, and school group activities. The museum’s three-story gift shop is a great place to find memorable souvenirs and gifts. A food court-style restaurant is open daily from 10 a.m. to 5 p.m. This is one of the busiest Washington DC museums. Arrive early in the morning or late in the afternoon to avoid crowds. Purchase IMAX or Planetarium tickets in advance or as soon as you arrive. Allow at least 2-3 hours to explore the exhibits. There's a companion facility, the Steven F. Udvar-Hazy Center in Chantilly, Virginia. This museum can be easier to get to from the suburbs and is usually not as crowded as the Mall location.